Here is something I have been working on for a little bit. I think it would work well in the right game. Leprechauns are small humanoids that live in the same general areas as do elves. While elves prefer the open spaces, Leprechauns live underground in elaborate burrows and low. They share many similarities with halflings and gnomes but are actually more closely related to pixies, faeries and distantly elves. The typical Leprechaun stands 3' to 3½ ' tall, and weighs about 45-50 lbs; About the same size as a Halfling. Their skin color ranges from tan to a pale, if pinkish hue, their hair is typically any shade or red though some are darker, and their eyes can be any shade of green. Leprechaun males typically have longer beards the same color as their hair. Leprechauns generally wear natural fibers with quite a bit of green in them, though they decorate their clothes with intricate stitching or fine jewelry. Leprechauns reach adulthood at about age 40, and they live about 400 years, though some can live almost to 600 years. A Leprechaun character must have a score of 9 or higher in both Charisma and Dexterity. 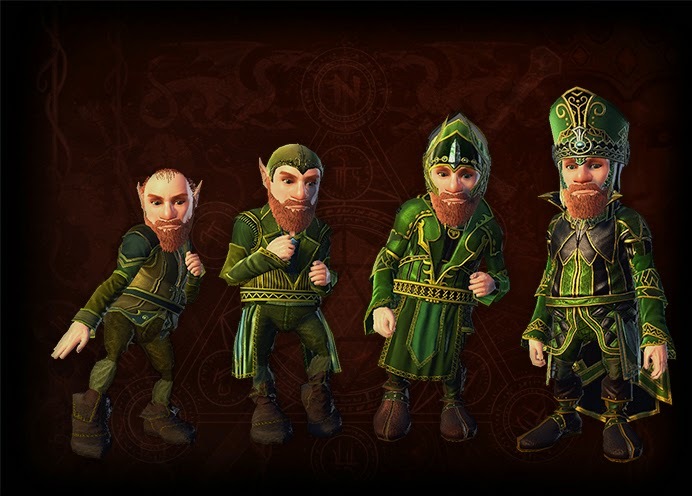 Leprechauns are similar to Elves in terms of play, they can act as fighters (though not as good as true fighters or Dwarves) and can cast spells as do Magic-Users, though they are limited to the Enchantment school. Leprechauns are inherently magical, many excel in areas of enchantment and other magic, and most all Leprechauns know at least a little magic. Adventuring Leprechauns can cast wizard spells as indicated below. Leprechauns tend to be Neutral in alignment, but quite a few are Lawful. Chaotic leprechauns are known as Fear Deargs. These leprechauns are of sour temper and typically wear red. Prime Requisite: A Leprechaun has two Prime Requisites: Wisdom and Dexterity. If either of these Ability scores is 13 or greater the character gains a 5% bonus to Experience Points earned every adventure. If both are 13 or greater, the XP bonus if 10%. Weapons and Armor: Leprechauns may use any weapon, but it needs to "sized" to fit them. Typically any weapon sized for a Halfling character. Leprechauns may not use "two-handed" handed weapons such as two-handed swords, long bows, battle axes, and other larger weapons. Leprechauns may wear any type of armor, but most prefer "natural" armor such as leather or hide. Leprechauns may use any magic item that is useable by Magic-Users and any magic weapon. A Leprechaun has a number combat advantages, due to it's size and familiarity with various terrain. Combat: Leprechauns use a combination of melee weapons and magic in combat situations. All Leprechauns gain the following bonuses when in combat. -2 bonus to Armor Class when attacked by creatures larger than man-size. + 1 bonus to initiative rolls. Luck: The greatest power of a Leprechaun is it's "Luck". Once per day the Leprechaun can effect one die roll with luck. Giving it an automatic +1. This feature must be used before the roll is made, but it can be used on any sort of roll. As a leprechaun increases in levels he may use a spell slot to convert spell levels to luck. So a 4th level spell can be converted to +4 on a roll. The points have to be used at one time, no splitting them up among different rolls. Superstitions: This is considered to be the other side of their luck ability. In order to have good luck the leprechaun has to observe a number of superstitions. While they might seem to be harmless or even non-sense the leprechaun must follow them or take steps to avoid them. For example a leprechaun will typically carry a lucky charm, such as a four leaf clover or rabbit's foot, for every level they have gained. If they do something that would normally cause bad luck (lighting three on a single flame, walking under a ladder, letting a black cat cross their path) they must use their luck item or do a small ritual to "break the curse". This could include putting a lucky copper piece in their shoe, kissing a "blarney" rock, whistling a song backwards, or any number of other small rituals. Failing to perform this ritual right away will result in the loss of one point of good luck. Hiding: Leprechauns are difficult to spot. In their natural habitat, dense wooded areas, low hill lands and natural (not man-made) underground formations a Leprechaun can only be detected 25% of the time (GM rolls). In man-made dungeons this increases to 35%. The Leprechaun must remain still and not be carrying any type of light. Leprechaun's Gold: There is a legend that leprechaun's guard a pot of gold. There is some truth to this. If someone were to beat a leprechaun in some form of personal challenge (cards, drinking, or being found when they would rather stay hidden) the leprechaun is obliged to grant the winner a gold coin. This coin will grant the winner a single +1 to any roll. This luck comes from the leprechaun's own pool of luck for the day. Languages: In addition to the common and alignment languages Leprechauns may also speak Leprechaun, elf, gnome and goblin. Vision: A Leprechaun can see twice as well as a human in low-light conditions (starlight, moonlight, torchlight and a "light" spell, but not "Continual Light"). Spells: As mentioned, Leprechauns can use Magic-User spells like an elf. They favor Enchantment and Charm spells. Leprechauns cannot use necromancy. Leprechauns may advance only to 9th level "Tighearnán" (male) or "Tuilelaith" (female). This is balanced by the Leprechaun's magical ability and their ability to also fight better than a same level magic-user. At 9th level a Leprechaun may settle in area and attract other Leprechauns to form a clan, or gather their family together for a clan as it's Chieftain. In any case there will only be a small gathering of immediate family and some close relations. Leprechauns are so spread out though they immediately assume any other leprechaun they meet must be a related and refer to each other as "cousins". Leprechauns are known as "solitary faeries". This makes them great candidates for an adventuring race. They will settle down in a area but there must not be any other faerie species in the area, especially pixies and other "trooping faeries". Leprechauns and Pixies have an uneasy truce. Leprechauns use the same attack to hit rolls as do fighters, dwarves, elves and Halflings. Exalt! Great job here. No complaints. Just the right amount of fluff and great niche carve out. Wow...a leprechaun character class was NOT what I was expecting.